Every day, approximately 22 former and Active Duty U.S. service personnel commit suicide as a result of the effects of PTSD (Post Traumatic Stress Disorder) and CRS (Combat Related Stress). This is more than we lose in actual combat. And... THAT IS UNACCEPTABLE!! It is our Mission to help veterans and their families live a more complete life and eliminate the veteran suicide epidemic plaguing our nation’s warriors by fostering the Mind, Body and Spirit. We believe strongly in "Serving Those Who Served Us." To accomplish this, we will focus on those three tenets. Mind – We will cover the cost of acquisition and the training of Service Dogs, through HomeFront K9, for veterans. Dogs work, there is no doubt that the unconditional love of a dog helps in so many ways. We have seen it over and over. Body – We partner with other programs such as hyperbaric oxygen therapy and other organizations that retro fit homes for physically disabled veterans. 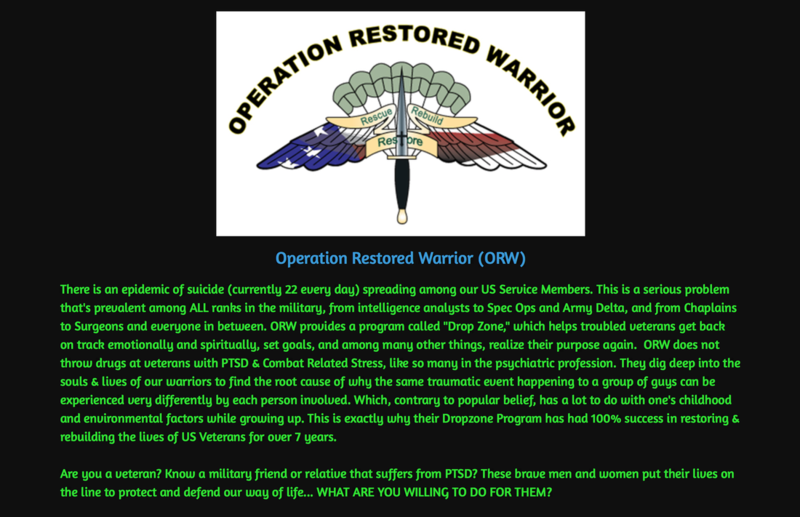 Spirit – We have worked with several different organizations that help our warriors through the darkness of combat and emotional stress and back into the light. One of our veterans called this experience his re-birthing. We have seen these types of successes over and over. The last thing a serviceman or woman should have to worry about is the safety of his or her family back at home. He shouldn't have to wonder if he's jeopardizing the safety of his family by choosing to protect his country. Because of this, our core mission is to donate protection dogs to the families of active servicemen and women, specifically those in the special operations community. Dogs can sense trouble from a mile away and alert their owners. If the need arises, they can also defend their owners. Dogs are lifelong companions and force multipliers. **The goal is for the rider get intimately involved with the cause and keep them focused and excited about the challenge they are taking on. So the entrance fees and fundraising goals are based on a tangible number that makes each rider personally responsible for participating in saving a Veterans life! Our service members' lives are on the line! **Please see details on fundraising options and goals by clicking on the "I'm ready to roll" button below. Want to get involved without riding? We have Volunteer needs for drivers of support vehicles, bike repair tecs (at the Navy SEAL Museum), as well as Chiropractors (at the Navy SEAL Museum and at after party) If you would like to participate in any way, please click on the link below.